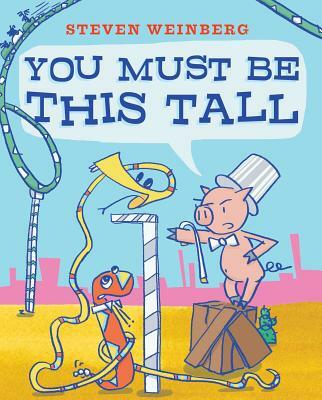 Two friends—one short and one tall—must come up with a plan to overcome a serious height restriction so they can ride a roller coaster together in this delightfully cheeky and bright picture book from the author of Rex Finds an Egg! Egg! Egg! Best friends Frank and Harold do everything as a pair. And at the fair, they want to ride the roller coaster together, too! But one of them isn’t tall enough. Can this energetic duo think outside the box and figure out a way to overcome the height restriction and ride the roller coaster? Find out in this adorable picture book that celebrates the value of friendship and encourages problem solving from Steven Weinberg. Steven Weinberg loves to draw and write. He is the author and illustrator of Fred and the Lumberjack, Rex Finds an Egg! Egg! Egg!, You Must Be This Tall, and the illustrator of Beard Boy. He lives in the Catskills, where this book takes place. Learn more at StevenWeinbergStudio.com. "This cheeky book delighted my children so much that they made me read it three times in a row. It has become a staple of our bedtime routine."